The romance of the tropics... surely there can be no more perfect place to make a commitment to a future with your partner. Whether you are marrying for the first or subsequent time (or re-affirming your vows) it is a surprisingly simple process. Weddings conducted in Vanuatu are legally binding and recognised worldwide, however you will need to notify the relevant authorities and complete and lodge certain documentation at least 28 days prior to your wedding. We can arrange this for you or your resort can. You will need to fill out a notice of intention to marry and provide copies of birth certificates, divorce papers (if applicable), and passport details. The Lord Mayor of Port Vila will conduct the civil ceremony. 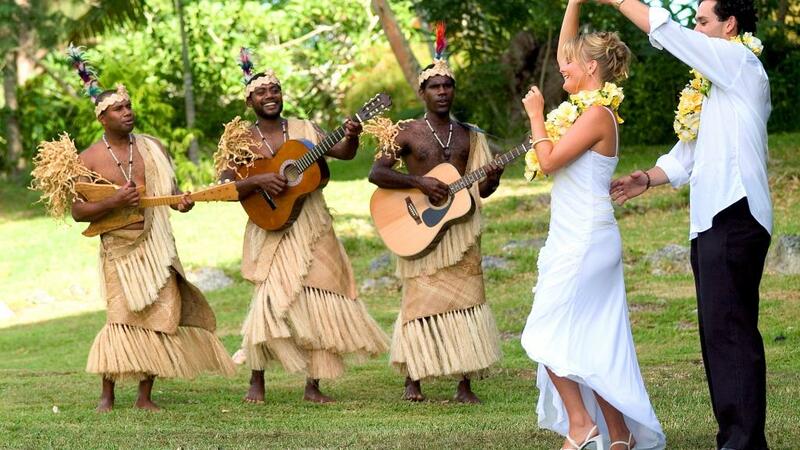 Below is an example of what you would typically get in a Vanuatu wedding package. A Variety of venues for the ceremony: Wild Ginger Deck, Island Suite garden & Beachfront Wedding Bure. Floral heart on the sand, deck or garden.